I was really excited about this opportunity as I read the book years ago and really loved it. Unfortunately, my excitement was put at bay a little once I started seeing articles circulating around about how “anti-Christian” and “blasphemous” the book, and now film, was, in some Christians’ opinions. How to make income from your blog! Follow this link to learn how to make income from your blog via sponsorships and your readers. Still against ‘The Shack’? Or have you seen it and are loving it? Either way, this next post is for you and shares a bit of my personal testimony. Link is below. Be blessed! To my fellow Christians who are boycotting ‘The Shack’ (and those who are loving it! )- here’s how God can use you. Previous Post What they don’t tell you after you have a second kid. 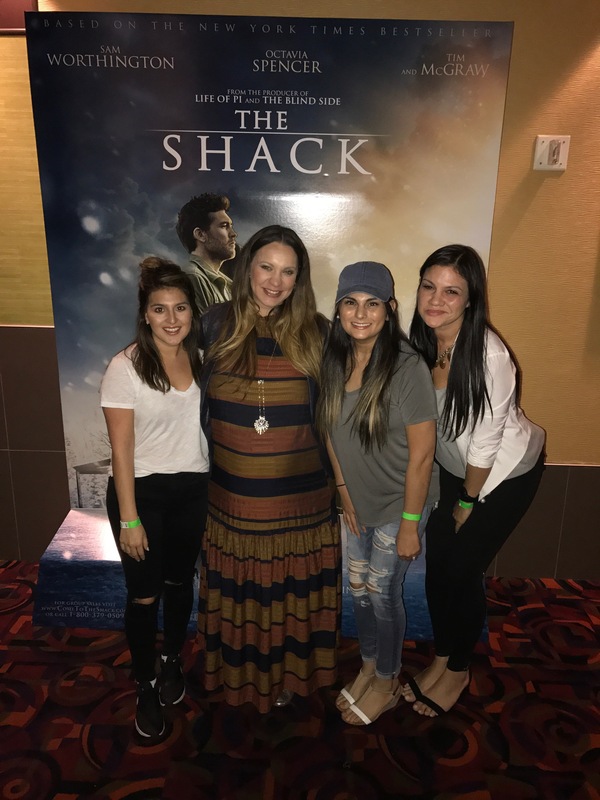 Next Post To fellow Christians who are boycotting ‘The Shack’ (and those who are loving it!) – here’s how God can use you. Thank you!! I couldn’t have said it any better than you did!!! I loved the book and the movie,awesome ! I am a survival of physical,mental abuse from a father which led to sexual abuse and even though I gave my heart to the Lord I could not get past God being male, when I read the book and as God revealed himself as a woman I began to relax and enjoy the story not realizing until the end how He was healing my hurt , because of this I have a Papa, what a healing journey this book and now a movie has taken me on.! I grew up with a father who was an alcoholic from before my birth. My alcoholic dad died in his forties. I witnessed and experienced a great deal of rage growing up. My daughter was sexually abused by by someone who eventually served time in prison and was added to the register for sexual offenders for abusing another girl. I did not find out about my daughter’s sexual abuse until she was in high school. I cried a lot during the movie as I re-lived experiences from my own life. I truly appreciate the desire of this movie to display the grace of God. I agree that our world has a desperate need to understand the grace of Jesus Christ. But the grace and love of God cannot be properly understood apart from the justice of God. According to the testimony of most of your readers, The Shack has had a deep spiritual impact upon their lives. If The Shack has a deep impact on a person’s spiritual life, but contradicts some element of the truth about God we understand from the Scriptures, then those contradictions should not be dismissed with the wave of a hand. If so, then the god of The Shack is the god of your imagination. Was Jesus wrong when he said, “My God, My God, why have you forsaken me?” According to the movie, Jesus did not know what he was talking about. Was Papa right when she added, “Sin is its own punishment?” If sin is its own punishment, then why did Jesus need to be punished? If sin is its own punishment, then was Jesus foolish for going to the cross? Perhaps crime is its own punishment as well. If that’s true, then to incarcerate or to level a fine against even one person is a travesty of justice. The Shack paints a very compelling and powerful image of God by means of a moving story. What comes to your mind when you think about God as portrayed in The Shack? When the Apostle John, “the disciple whom Jesus loved,” saw the glorified Jesus in Revelation 1, he “fell at his feet as though dead.” This is the same man who rested his head on Jesus chest at the last supper. What comes to your mind when you think about God? Is it the God of the Bible in all of his holiness and transcendence and justice and love and grace? Is it truly a reflection of the immortal God, or is it an image “made to look like mortal man (Romans 1:23b),” an image edited just enough to bring it within our own comfort zone? Hi PJ…. I’m so sorry for everything you’ve been through and I want you to know that I agree with you wholeheartedly. Thank you for taking the time to share your view. Please read my next post where I speak in more detail about how the Shack is not the Bible, but rather has a very specific intent to show certain characteristics of God to hurting people. And yes, people may leave the theater with only a partial view of who our true God is. He is a God full of grace, yet there will be a time of wrath where He will pour out His judgment on those who reject Him. He, by nature, cannot accept sin or allow sin into Heaven. He is a holy God! And a good God! And we are to be held accountable for our actions. The Bible says wide is road that leads to destruction and narrow is the way that leads to eternal life. But I don’t think that this film cannot and won’t be used by God. As concerned Christians, let us be the ones to pray for everyone who will see this film, that they’ll be encouraged to run to a Bible believing church, surrounded by strong and loving believers who can help them in their journey of salvation and relationship with Jesus. Let’s meet with people we know are seeing this and see how we can answer questions they have and pray with them! I’m getting bombarded with messages and while unfortunately I can’t respond to all, I am trying to get to as many as I can and share truth and offer prayer. I give more ideas here on how we as the Church can love on these people who are clearly hurting and may not know much about God, but whose hearts are sincerely open! You are right PJ… but let’s make even more good and seize an opportunity God has given us where hearts are wide open. Much love to you and God bless!!! Psalm 22 has always helped when I thought Jesus was forsaken at the Cross. It helped me realize in His humanness he “felt” forsaken but wasn’t and I am not, even when I feel I am or forget His promise NEVER to forsake. :24-For He hath not despised nor abhorred the affliction of the afflicted; neither hath He hid His face from Him; but when He cried unto Him, He heard. This is why I will watch it and then have my say. As a pastor I am very protective of how people reprsent my God. If this film waters down or misrepresent the Word of God then I will say so. We as Christians tend to except watered down versions of Gods word in order to make profit, is unexceptable. So yes I will check it out with an open mind and open Bible to fact check. Absolutely Pastor Artie… and again… keep in mind the intent of this film/story. It’s audience is to hurting people who do not know the nature of our savior and may have only hear the fire and brimstone version and been turned away by it. See the part two article I wrote to this one as I explain more about how we, the Church, can be used by God to explain further truth to people as their hearts are open by this film. God bless you! I think that many Christian leaders have had ‘issues’ with every theatrical format where Christ’s words are not quotes from scripture (especially KJV) . Lighten up! This movie and book are not scripture. Many didn’t like “The Living Bible” because it was paraphrased, yet many came to Christ through its readability! I have not seen the movie, but I did read the book and loved it. I found the message to be one that could help ones faith, or bring them to having faith. I hope when I do see the movie it is like the book correctly. The Shack. 🤔 You’d think with all this fuss, there would be numerous glaring areas that did not line up biblically but I didn’t see any. Thank you for saying what I was thinking! I read the book just after my son died and was totally taken by this story! The movie even more gave me clarity and strength to move forward! I praise God for this book and movie! Very well said….. I read the book at least ten times and did a study with a friend……and I loved the movie! The evil one is alive and well and attacks in many ways …..even through this awesome movie….. Thank you for your words. I think you did a nice job on this. I get so sad when Christians attack things because they aren’t “Christian enough” or because they don’t follow every tiny point of theology in the same way. We often end up pushing people away because they only see people passing judgement and being holier-than-thou. Thank you for positive words. Agree with you – the movie is entertainment that can show people a perspective of God that many secular folks may have never considered. I read the book and saw the film and believe it was beautifully done. I saw God work a miracle when taking my daughter to see tjis movie. A mom of 4 and struggling to feel loved and lonely. A women next to her loved on her through the movie patting her hand giving her tissue,then afterwards praying over her as only God would know. Why because Jesus wanted to show her he sees all her heartaches and tears. The next day her life was saved within a couple minutes to death by 911 mak8ng it on time when she had a sevete allergic reaction and face tongue and thoat swelled. I know it was the prayets tjis women prayed that God used to save her. My heart breaks from tje judgements made. God uses what God choses to use. Its up to us to search the scriptures for His truths. The testmony of the writer is amazing and full of tje healing power of God. Oh my goodness-That is so annoying! I can’t even see the ads on my blog post- it just shows me at the very bottom that my reader may see an ad. Can you look at it on your phone? Hi Dorothy, I’m a former English teacher so definitely know that! Can you let me know where the typo is so I can fix? Thanks! Hi Dawn! I read this and agree on most points actually …. however, read what I said on my next blog post regarding the INTENT of Young’s work of fiction called The Shack. Also, I’ve linked a post below on why Young says God isn’t a Christian. This actually provided me a lot of insight as well on why Young says some of the things he does. Straight from the horse’s mouth too, which I like. I read the book more than once and l have already seen the movie. Like many others, l believe God used it to comfort me on a level l had never before experienced. Because someone suggested that l read THE SHACK while still in the pain of the breakup of a 38 year marriage and the subsequent crippling steps into my new identity as a single mom and grandma, l was enabled to crawl through. God is not in anybody’s box. He will leave the 99 and go find the one. I was the one, you were , and still so many others. Ephesians 4:11-12. I believe this list includes movie producers and authors and writers and all kinds of creative people. He can handle His business . I pray this beautiful story continues to bless many. I read the book about 5 yrs ago I believe but not sure. I loved it so much but now don’t know what happened to it. I may have to buy another one. I haven’t seen the movie yet, but certainly will! Very good movie that all should take the time to watch. Beginning difficult for me to watch but the rest of the movie just a great sermon! I attend a large non legalistic church that I can and do invite anyone to attend. I loved the book and certainly will see the movie when I can. I have been a Christian for over 40 years. Unfortunately, I see way too many Christians who want to put God in a box and reject anything that doesn’t agree with their patent view of who He is and what He is like. Through leading Bible studies, I have studied scripture deeply. I have seen the many faces that God and Jesus show to those who need him. He is certainly not static. He is certainly not bounded by just what you read in the Bible. He is present and alive in all of our lives every day. Often, we don’t see Him because we weren’t expecting the form that He reveals to us at any given time. I will continue to pray for those Christians who can’t accept that God lives outside their parameters and think they must judge. God has told us about judgement and let us know that it is His and His alone. I was so deeply touched by this movie. If I would’ve let out one sob I dont know if it wouldve stopped! Wow. What an amazing portrayal of God meeting us where we’re at and revealing an aspect of himself that we need at that moment. Thanks for sharing your heart on this. Thank you for your wonderful comments! I Met Paul Young at the First Baptist Church in Morehead. You are so correct in your comments. I loved the movie and hope everyone goes to see it. I plan to see it again! Thank you! Thanks for this article. I 100% agree with what you have said. I also was looking for all the horrible heresey everyone was talking about and didn’t see it. I was blessed by seeing this movie. I would recommend Christians go see the movie before they take the word others and boycott a beautiful story about God’s love and the importance of forgiveness. I had the same reaction when I shared the book, with fellow Christians. They either LOVED it, like I did…or hated it…blasphemy!! It all depends on your view of God. Do you put Him in a box, on a throne…you go to HIM…you limit Him. The truth is, He meets you when, where and how you need to be met, anywhere, anytime….He is GOD!! I too, couldn’t put the book down. When I did, I had a fresh cup of coffee with Jesus! I read the The Shack years ago and couldn’t put it down! The book just helped me understand that no matter what God is there for us and shows us this in many ways. As far as humanizing it – God sent the ultimate human to earth so that we “humans” could relate on our level. I haven’t seen the movie but cannot wait to! This writing from you was the most beautiful christian explanation I could have ever heard, and you are a wonderful example of the Christian we all should strive to be. Thank you ! If anyone wants to talk to or challenge Paul Young, he’s appearing in Orlando on April 1 in a Q&A seminar with the audience. http://www.theshackseminar.com There is certainly a lot to discuss here, and I think the image of an angry old white man as God needed a much-deserved makeover. Physical and mental can also be so devistating on how you relate to yourself and others. This movie reafirms that God loves you so much the very breadth of it strewn across a wooden beam. He is ever present and waiting for you to talk to him about everything. I will never forget the night he asked me to forgive him! Yes God wants you to forgive him. As much as we need to forgive the ones who have hurt us for our good it is the same with Him. I had experienced love and forgiveness towards the very people that hurt me so deeply and i thought i could never do that the rage and hatred i had in my heart towards them was all consuming but when that miracle happened he clearly asked me “when are you going to forgive me?” I was shocked and immediately responded with ” what?” And he repeated “when are you going to forgive me?” ” you are God you dont need forgiving ” ” but you have held me responsible for everything they did” There it was Truth i held a secret grudge toward God unspoken for years in prayers and conversations with him but never speaking outloud that charge. Be like Job and never charge God was my thought . True and complete healing began after that night and he revealed how none of what had happened to me was any part of his plan. Jesus stands at the door and knocks I love looking at the shack like this go to the place of ugliness face the door where the secret hides behind when you open it you will see the truth of it and HE is right there to expose its lie and facade that you fear will destroy you. He is God Almighty he is your El Shadi, he is Jehova, he is yahwe, and thru the many names and their meaning he has restored his place as Father in my life and he wants to do that for you too that word for me no longer makes me sick it now means pure love and safety and in him i can open my whole heart. I hope that you can too! I believe God is reaching out and calling his children home to him. To walk and commune with him as Adam did. Go to the garden of your soul daily and open your heart one secret at a time and let his love envelope and speak to your spirit. I believe thru Paul Youngs writings many many people will be restored to their Heavenly Eternal Father! When I read the book, it changed me, and enabled me to finally forgive two people who really hurt myself and my wife. It also took GOD out of the box I had HIM in and realized how he could open up Himself to us in whatever way HE wanted to teach us of HIS unbounding love and desire to be close to us and for US to love HIM back! We cried at least 3 times. The butterflies were a special symbol for us as GOD sent a literal butterfly ( which is a symbol of NEW LIFE) after she was completely cured from her lung cancer. Yes, an operation was needed but GOD was with her the whole time. Loved the movie , but can’t believe the flak I get at Church from those that have an opinion but have not seen the movie! Seriously thinking about looking for another church! Yes God is so good and so glad He used this film to bring you to a place of forgiveness. God bless you! Yout thoughts are my thoughts. Thank you for sharing your insight in this great movie. Thank you Adriana!!!!! You’re so welcome! Can’t wait to watch it again!